An excellent source of information for both the foreign and domestic auto enthusiast. 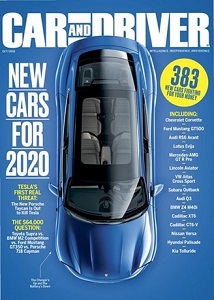 Car and Driver Magazine uses an objective yet entertaining manner to describe their road tests on cars, pickups, vans, and sport-utility vehicles. In addition to their well-known car reviews, you will be given news about the latest technology, developments in the industry, and political factors that affect the automobile business. Other feature articles include motorsports and important personalities.